Can you believe August is here already?? I know I can’t! The heat is definitely still on, but fall is just around the corner. Celebrate the remaining days of summer with our favorite arrangement of flowers, Share A Little Sunshine, from your local florist! Beauty of Summer Indoors. In this heat wave, my flower garden is looking pretty shriveled. Luckily I can still bring the beauty of flowers indoors with the help of my florist. You can too! No matter what your favorite style or budget, your florist can work with you. It’s amazing what the power of flowers will do! Perfect For Parties. If you are throwing a party or get-together, this would make a perfect addition to your decor. Spruce up your event quickly and easily with the beauty of flowers. Whether you’re grilling with friends or hosting a book club party, flowers are the way to go! Share a Little Sunshine is a beautiful arrangement that fits all occasions, or check out our Summer Flower collection available from a florist near you! If you don’t know your local florist, we’ve got a handy local florist finder to help you out! Whatever your reasons to send flowers this March, always always always use a real local florist! Can you believe it’s 2012 already? Ring in the new year with Silver Bells — our featured arrangement for January! This beautiful arrangement features flowers in winter colors, accented with unique silver leaves and ornaments. Can you believe it’s the first of December already? The holiday season is in full force. With the big sales after Thanksgiving and everyone getting their Christmas shopping done early, it’s no wonder most people are taking time in early December to relax. What better way to de-stress than by ordering beautiful flowers for your home? This December, our favorite flower arrangement is Winter Wishes. This non-traditional design is perfect for those wanting a little fun in their holiday decor. It features everyone’s favorite flowers, red Gerbera daisies along with shimmery silver ornaments that ring in the Christmas Spirit! With it’s bright red carnations and playful white snapdragons, this flower arrangement is perfect for all ages. Move over poinsettia, this fun holiday design is coming through! Remember, always shop local when buying flowers. Flower Shop Network is here to help you connect to a real local florist. This month’s favorite flower arrangement is all about fall and harvest time. As we mentioned in the recent article, Feeling Fall-ish, this season was once mainly referred to as harvest. In this design, Harvest Moon, you see lots of great elements that remind us of harvest time: hypericum berries, mini cattails, fall leaves and lotus pods. The beautiful range of deep colors are also perfect for the season. You can’t go wrong with this beautiful autumn flower arrangement adorning your October decor! I know it’s not fall yet, but almost is! Fall Treasures (pictured above) mixes the brightness and sunshine of summer with the warm palette of autumn, which is why it’s perfect for September! Good Neighbor Day is September 7th – Send flowers to your neighbor to brighten their week! National Grandparent’s Day is September 11th – Grandma & Grandpa would LOVE to have this array of cheery flowers! The first day of autumn is September 23rd – Nothing says fall like the warm colors of autumn; this design is a festive way to celebrate the changing seasons! So if you need to send flowers in September, remember the Fall Treasures flower arrangement for big smiles every time. This month’s favorite flower arrangement is called Hooray For Summer because it is one of our favorite seasons and we want to shout HOORAY! I know summer is drawing to an end, but let’s continue to celebrate the spender of the season while it’s still around. Hooray For Summer bouquet is filled with lush greens and beautiful bold colors that instantly transport you to a tropical oasis state of mind. If you need a pick-me-up from this heat, Hooray for Summer is sure to do the trick! Daydream about tropical forests and cool pouring waterfalls as you lounge on a beach and listen to the birds of paradise. It doesn’t get much better than this! Send a summer sizzler with this stunning flower arrangement. Brilliant oranges and vivid yellows will put a bright and cheery smile on even the gloomiest of faces. Looking for a great gift? 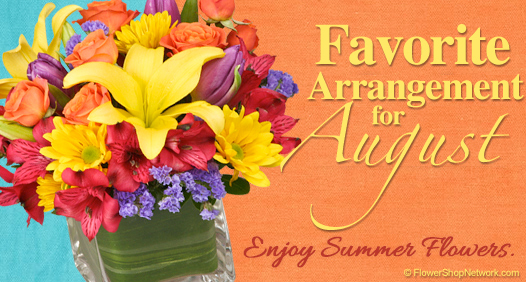 Don’t sweat it, your local florist has the perfect gift for any of this season’s occasions — sizzling summer flowers! Are you attending a block party or BBQ? Fresh flowers make fantastic hostess gifts! How about summer birthdays? Who wouldn’t instantly perk up with a peak at these bold colors? Maybe you just want to update your home decor; do it with summer flowers! So, if you’re shopping for hot summer gifts, or looking to give your drab room decor an upgrade, look no further than this summer sizzler! With Mother’s Day right around the corner, it’s no wonder we picked Remembering You Bouquet as our favorite flower arrangement for May. This arrangement features flowers every mom will love — mom, grandmother, even the mother-in-law! The stargazer lilies and irises give this arrangement more of a traditional look, but the hot pink Gerbera daisies and roses add in some fun! Whether at home or at the office, having these gorgeous flowers delivered to mom will make her feel loved and remembered. The beautiful, long-lasting blooms of this arrangement will keep a constant smile on her face.